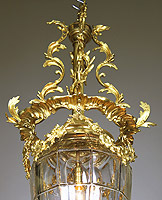 An Ornate French 19th-20th Century Gilt Bronze and Gilt-Metal Molded Glass "Versailles" Style Rococo Revival Single-Light Hanging Lantern. 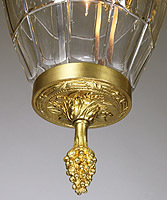 The elongated molded and cut-glass body surmounted with intricate floral wreaths and acanthus, the bottom gilt bronze cap ending with a floral design with a cluster of grapes finial. Circa: Paris, 1900.